Over 1,200 dogs have become sickened with the Canine Influenza Virus, and 6 have died in Chicago in an outbreak over a two week period. Cornell University is reporting that the outbreak is caused by a virus closely related to the Asian strains of influenza A H3N2 currently in circulation in Chinese and South Korean dog populations. This virus may also infect cats, however, to date there have been no reported cases in the Chicago area. The Chicago Veterinary Medical Association has put out an advisory for travelers not to bring their dogs into the area and, if you are exposed to dogs in the area, to thoroughly wash your hands and clothing before coming home to your dog. While Chicago is many miles from us, their situation demonstrates how quickly the virus can spread and that prevention is always key to enjoying a long, happy, and healthy life with your dog. In today’s world of frequent travelers, miles often provide no protection from the spread of disease and, in fact, this disease has now spread to 4 states, Illinois, Wisconsin, Indiana and Ohio. We have advised the Canine Influenza Vaccine for our patients because this disease is so highly contagious. We have now received notice from the NJ Department of Health that all operators of places with exposure to multiple dogs, such as boarding kennels, daycare centers, pet shops, shelters, etc. should require vaccination against CIV. Even though the vaccine was created for the H3N8 flu virus, it is believed the vaccine will offer some protection and lessen the effects of the H3N2 virus. If boarding, the NJ Department of Health is recommending that the vaccine should be administered one month prior to entry to the facility. There is no vaccine for cats. Dogs are most contagious during the two to four day incubation period when infected and shedding the virus, but not yet showing signs of illness. Almost ALL dogs exposed to CIV will become infected, 80% develop illness, with an 8% mortality rate. While the percentage of dogs that died in Chicago to date is very small according to statistics, it is not a small matter for the families of those six dogs. Canine Influenza Virus (CIV) is easily spread from infected dogs (coughing and sneezing), contaminated objects (walking where infected dogs have walked, picking up a stick that an infected dog walked on, urinated on, or had in its mouth, etc. ), and people that have had contact with an infected dog. People are not susceptible to the disease, but can transport it between dogs. 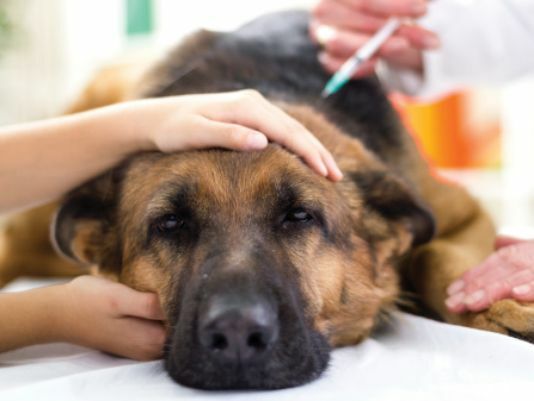 This outbreak reinforces that certain vaccines recommended by Ridgewood Veterinary Hospital are very important even if we don’t hear about them on a regular basis. If your dog is currently vaccinated, we thank you for protecting your pet by trusting our doctors to give you the best advice possible regarding preventive care for your pet. If your dog is overdue or will be due for the CIV vaccine in the next month or two, please vaccinate to insure maximum protection within 30 days. A Client Care Representative can give you the expiration date of your dog’s CIV vaccine or you can review your pet’s medical history on Pet Portals. Don’t give CIV a chance to cause you and your dog the pain, heartache, and expense of contracting Canine Influenza Virus. Please call now if your dog’s CIV vaccine is expired or is expiring soon to maintain maximum protection. Visit this link for Fox News coverage or press play on the video below. Visit this link for NBC News coverage.